Pallas’s Warbler (Phylloscopus proregulus) of the Eastern Palaearctic (Siberia, China, Himalayas) resolves into a complex of four closely related but distinct allospecies forming a superspecies, P. [proregulus]. Assignment of species rank is based on cytochrome-b gene sequences and on vocalisations (territorial song and calls). Morphological divergence is poor, as is typical in Phylloscopus. 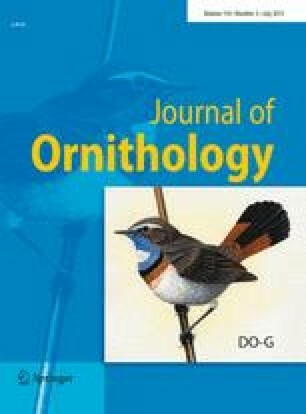 It applies to size (nominate Siberian proregulus as opposed to the Sino-Himalayan taxa), and slight coloration differences among the latter taxa do not correspond to the cyt-b topology and are considered to be adaptive. Vocal differences relate to syntax (verse song vs endless song), frequency (broad vs narrow bandwidth, allocation of elements within the frequency band), form of elements (ascending vs descending parts, combination of these), and repertoire size. Strong premating isolating mechanisms are assigned to vocalisations. Contrary to current taxonomy, we propose the following constituent taxa of the Phylloscopus [proregulus] complex: Phylloscopus proregulus s.str. (Siberia, disjunct from the following taxa), P. kansuensis (China: Gansu, Qinghai), P. forresti (W/SW China, part of E Himalayas? ), P. chloronotus with two subspecies: P. c. simlaensis (W Himalayas), and P. c. chloronotus (C and E Himalayas). Contact zones and possible hybridisation between the Sino-Himalayan taxa remain undetermined. A closely related isospecies is Phylloscopus yunnanensis (syn. P. sichuanensis), which is locally sympatric with and extremely similar morphologically to P. forresti and P. kansuensis. Cyt-b distance values range from 3.1% to 4.6% within the P. proregulus complex and from 7.5% to 8.4% between the latter and P. yunnanensis. This corresponds to differentiation times of 4.1 to 5.5 Myears (P. proregulus complex vs P. yunnanensis) and 1.7 to 3.2 Myears (within the P. proregulus complex). *Results of the Himalaya Expeditions of J. Martens, No. 247. – For No. 246 see: Ann Zool Warszawa, 2004. This revised version was published online in July 2004 with corrections to a heading and species names. This paper results from a multitude of expeditions to Nepal, China and Siberia occurring within the last 34 years (1969–2002), on which J.M. collected vocalisations, blood/tissue samples and voucher specimens of Phylloscopus warblers. Additional tissue samples were provided by M. Fischer, H. Grimm and A.A. Nazarenko and tape-recordings by S. Ernst, M. Päckert, P. Singh and B. Veprintsev. D. Plath accompanied J.M. to Nepal in 1973, A. Ausobsky and B. Frühbeis in 1980, W. Schawaller in 1988 and 1995, G. Geduldig in 1988, P. Kessler in 2001, S.I. Golovatch, A.A. Nazarenko and O.P. Valchuk to the Russian Far East in 1990, A. Gebauer and M. Kaiser to China in 1996 and 1998, C. Fischer, P. Jäger and J.M.’s wife Beate to China in 1997, Sun Yue-Hua and Fang Yun in China in 1999, 2000 and 2002 and D.T.T. and Bi Zhonglin in 2002. Prof. Dr. Jiang Zhigang made it possible for J.M., D.T.T. and Sun Yue-Hua to participate in the expedition into the Longxi-Hongkou conservation area near Dujiangyan, Sichuan. Deutscher Akademischer Austauschdienst, Deutsche Forschungsgemeinschaft, Feldbausch-Stiftung and Wagner-Stiftung, both at Fachbereich Biologie of Mainz University, Vereinigung “Freunde der Universität Mainz”, Forschungskommission of Deutsche Ornithologen-Gesellschaft (East Asia grants to J.M., A. Gebauer and M. Kaiser) and Gesellschaft für Tropenornithologie provided travel funds. Authorities of the Chinese Academy of Sciences helped to organise the travels within China. M. Päckert commented on an earlier draft of the manuscript. Many cordial thanks are due to all friends, colleagues and organisations mentioned. Phylloscopus proregulus s. str., part of the “endless” territorial song, recorded by S. Ernst (Fig. 3 a–h); background: Parus ater. Phylloscopus kansuensis, territorial song, 2 verses, recorded by J. Martens (Fig. 31); background: Carpodacus thura. Phylloscopus forresti, territorial song, song form A, 2 verses, recorded by J. Martens (Fig. 3 m); background: Seicercus valentini. Phylloscopus forresti, part of the “endless” territorial song, song form B, recorded by J. Martens (Fig. 3 n–p). Phylloscopus chloronotus simlaensis, part of the “endless” territorial song, recorded by J. Martens (Fig. 4 a–g). Phylloscopus yunnanensis, part of the “endless” territorial song, recorded by J. Martens (Fig. 4 k). Phylloscopus yunnanensis, part of a “call song”, China, Shaanxi, Taibai Shan, recorded by J. Martens (similar to Fig. 4 u–v). Phylloscopus proregulus s. str., call, recorded by J. Martens (Fig. 7 a). Phylloscopus kansuensis, call, recorded by J. Martens (Fig. 7 f). Phylloscopus forresti, call, recorded by J. Martens (Fig. 7 h). Phylloscopus chloronotus simlaensis, call, recorded by J. Martens (Fig. 7 p).